An extremely interactive, magical, musical adventure story and teaching tale from Haiti combining African and European story forms. Here’s a recent video of the full program. It explains why there are so many drums and so many drummers in Haiti. What makes this program special is that I hand out over 100 sound effects instruments to the audience as well as elicit incredible participation from EVERY audience member even if they have no physical instrument in their hands. 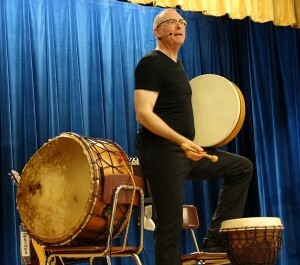 This program can also be combined with a “Cool Sound Effects Instrument Making Workshop” prior to the performance. Little did I know when I first read this Haitian folktale that it would change my life and take me in dozens of new directions. 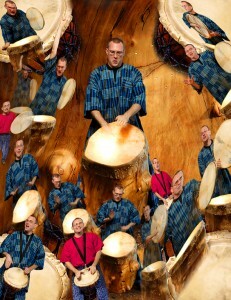 I was just beginning to combine the original songs I’d written for years together with traditional hand drums and stories from around the world. My first telling of the Drum of the Elephant King was very basic. Back in 1993 I stood up with a hand held microphone while my drum teacher played softly in the background. But there was something missing. I wanted to get the audience involved so it would become their story too. So I began to research what environmental sounds there were in Haiti. I had shakers. But there were no rattle snakes on the Island of Hispaniola, so the shakers became “Insects buzzing in the the grass”. I then learned that there are many chickens in Haiti. So I added a simple friction drum called a Cuica or Guica. It’s other name is “Chicken in a Cup”. Now the audience had two sounds. Another sound heard in the Caribbean is that of goat and cowbells. So the audience members were soon playing those instruments as well. Home-made rain sticks sound great! What time of year did the story take place? The rainy season. Soon homemade rain sticks joined the orchestra. Then an Ocean drum provided the gentle sounds of the “turquoise blue Caribbean sea”. I couldn’t afford to buy a lot of the instruments so I began to make them. That led to teaching other people how to make them as well. And that is just the natural sounds of the countryside. Later on in the story we have the sounds of Elephants stampeding, and magic happening. I found ways of introducing to audiences the fact that the country of Haiti is bi-lingual. I had the main character ask a question in French (do you know where I can find the drum of the Elephant King?) to be answered by the villagers (the audience) in Creole, Haiti’s unique language combining French and African language roots. But I was not done! Then, one Sunday morning as I read through the New York Times magazine section, I found an article full of beautiful colored pictures all about the coffin makers of Ghana in Western Africa. In that country to this day it is very important what kind of a coffin one is buried in. A fisherman will have a huge fish carved, a car dealer his favorite model auto, etc. In my research I had learned that many if not most of the slaves brought to Espaniola by the French Colonists were from Western Africa. So suddenly here was a deep-rooted cultural connection preserved in the form of a story. And then I sought out information on the history Haiti. Did you know that Haiti is the 2nd oldest republic in the New World? Did you know that Haiti was formed as the result of the only successful slave rebellion in the history of the world? I couldn’t stop! I looked at old maps and found “the Pine Forest” “The Saltwater Lake” and the “Giant River” that are created by magic in the story. The story was a geography lesson! But my point is, story telling and folktales can literally be keys that unlock a thousand doorways of interdisciplinary, multiply intelligent learning. But more importantly they can be used as tools to make learning into a joyful journey of discovery!